Living with less items of clothing makes me feel calmer and I actually feel liberated by having less choice. I take pride in what I wear and enjoy my organised and low maintenance wardrobe space. Having worked so hard at clearing my closet I feel invincible to any future clothing temptation. Charity shops. Moi, I only donate! I arrived at my 40 piece minimalist wardrobe feeling smugly safe from future clothing storms on the horizon. Ratio of tops to bottoms 2:1 Sorted. But like any decision to minimalise a part of your life you can occasionally doubt your actions. Questions, doubts and FEAR began to threaten the calm oasis of my minimalist wardrobe. It was almost enough to drive me to throw in the towel, rush to the shops and buy my way out of confusion. But then I gave my querulous self a pep talk. "What about your unique signature style? The style you've perfected and pimped for years and which permeates your very aura. Stick with it. It'll outlive any new trend and what suits another person might not suit you." It takes one outfit. One necklace. One pair of boots. A colour that really suits you. A fabric that makes you feel sassy. An accessory that makes you smile. So, my signature style outfit. 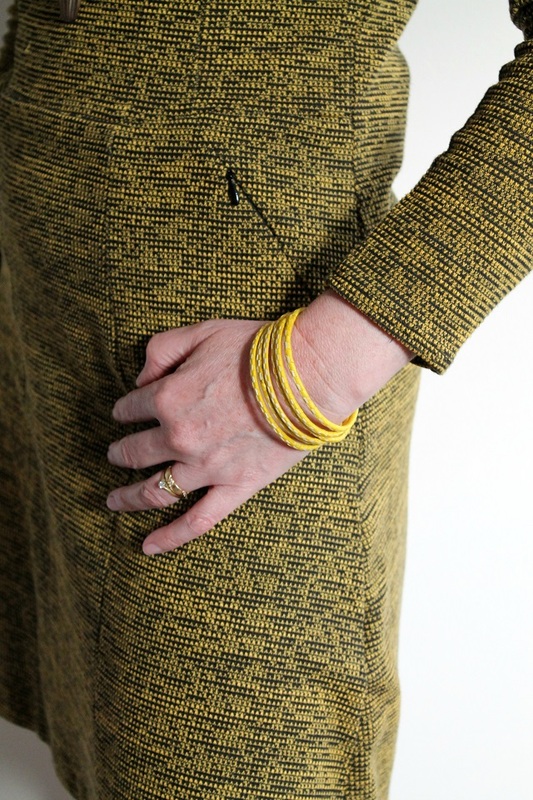 The mustard dress (in the photo) came from a charity shop (via H & M). I wasn't planning to buy a new dress/tunic but my old favourite had finally bitten the dust and been sent for recycling. I spotted the mustard dress as soon as I stepped into the store (with my mum) and after trying it on I was smitten (the subtle pattern, the pockets, the fit and flare). My owl necklace is an old charity shop find (that survives every jewellery edit), the bracelets were a Mother's Day present and the boots and tights came from M &S bought with vouchers from Christmas and my birthday. How very rock 'n' roll? No! OK, so I do wear lots of separates but I love a tunic or dress to wear with boots (flat or small heel). As a one piece outfit there's no need to coordinate or worry about silhouettes. The only decision to make is whether to team it with tights or leggings. This type of outfit fits my lifestyle and I can wear it for lots of different occasions. The colour almost put me off (not my usual) but sometimes it's good to break the rules. Choosing an outfit that makes you happy and you know you'll wear again again makes sense. Your signature style might be different. So you only wear jeans and jumpers. Or purple. Or hoodies. So what? This should be part of your capsule wardrobe. You're unique and so is your signature style. Don't copy anybody else's and don't feel intimidated by natty fashionistas either. Your style can be classy, colourful or contradictory. It doesn't matter as long as it suits you and your budget. Because. I like your signature style. I don't care where it came from, how long you've owned it, how much it cost or if it's all you own. It's possibly not perfect. But it's you. And I'd be so sad to see it go. Don't edit it out. Yes, we all need wardrobe staples, separates and neutral pieces. It's good to build them into your wardrobe and buy them when you can afford to. But don't ditch your signature style in the vain pursuit of perfection. Forget labels, trends, what everyone else is wearing. It's your style that counts. Perfect it, experiment with it, hone it and you won't need anything else in your wardrobe. Thank you! I've had a small wardrobe since I can remember, but lately I've been reading about the 10-item wardrobe. It doesn't work for me, it's a bit too minimal in my experience. Also, certain bloggers (not you) who push the 10-item idea seem to always be shopping for new items EVERY SEASON. I thought that was what we were trying to avoid! The problem is when you have so few clothes, they tend to wear out quicker since they're being worn so often. Unless you can afford to buy excellent quality garments (there goes the budget), I think it isn't worth it. I have, for me, the perfect amount of clothing where I can easily and quickly get dressed each day with everything mix- and-matchable. As an aside, my husband already gets tired of seeing me in the same outfits so often, so having even less, like the 10-item wardrobe, would probably send him begging me to buy more! This outfit looks great on you Claire, and you're an excellent ad for a capsule wardrobe. I've started taking pigeon steps towards a minimalist wardrobe but I've got a way to go - it took me more than 40 years to realise I can look really good in clothes, another 10 years or so to find my 'look", and now a few more to downsize the wardrobe. But I'll get there! You look amazing :) I feel that we are at the same stage in our simplyfying process. My wardrobe was a constant source of conflictment ( do i look fashionable? Is the brand right? do i have enough of each? Oh gosh look how much i spent/don't wear) You get the picture but i'm in a happy place right now and honestly, there ain't a lot in there now. I have a suitcase packed away (i'm losing weight-to feel healthy not 'look' good, big mindset change) so that when i pull it out in 6 months what doesn't fit in with me now will go. I also have started cutting and dying my own hair too :) I read all the time but don't often comment but respect to you for writing so honestly and from the heart. I enjoy every post. So very true! And perfect timing for me as have been angsting over what to wear to a party this weekend.......and nearly fell for the 'must have a new outfit' when I realised that I actually have several options in my current wardrobe that really are my signature style and will do just fine! It took my daughter to say 'oh i really like that dress Mum' before I got to thinking about it and realised that although it's over 10 years old it still looks good and that's probably because its my signature style! PS am loving your signature style! I think you look great & am quite envious of your signature style! I am about your age and have been working on paring things down clothes-wise for the last few years. It's been easy to hone in on an everyday clothing style, but the biggest problem I've encountered is when I need to dress up a bit ... nothing to wear! It's quite a challenge just to find any clothing of suitable quality, style, and fit for those rare occasions when I do go looking in the shops. You look great Claire! I am not so good at reducing my wardrobe to the minimum, even though I have clothes I haven't worn in years, or that are so worn out not even charity shops will take them. I am trying. I also started making my own, that way I have something I really like and that really fits. I needed this pep talk - thank you. I have a signature style, it's me all over. SImply jeans and jumpers in Winter, and jeans and shirts or t shirts in Summer. I'm comfortable, I can smarten it up for a night out or dress it down so low I'm mucking out the henhouse ..... but whatever I do to it it's ME. After about 15 years of wearing nothing but trousers or jeans because dresses weren't as readily available as they are now, they were either special occasion wear in the higher-end stores, or skimpy things for teenagers/20 years olds, but now there are lovely simple dresses available, and with sleeves which I must have - 70 year old arms aren't a pretty sight regardless of how much one creams them with lotions and potions! So once again I'm in dresses - I found three I liked in Crew Clothing in the autumn, and one in Monsoon although the Crew dresses fitted better. I have attempted to keep to a colour coordinated wardrobe, based on navy with coloured scarves as accessories. Also, being short, I team my dresses with matching opaque tights and shoes, so the colour continues right down and adds visual length. I love this mustard dress, it is elegant but with flat boots and tights, very stylish. I have re-found my signature style. I lost it after having Olly. I please myself, and feel good in what I wear. There is usually a Breton top involved...you look lovely in yours. I really like that look. I may invest in some ankle boots in the winter.My old faithfuls finally bit the dust after six years of loyal service.